Baptism is an act of obedience to God’s Word. Jesus commanded his disciples to baptize. Both the baptizer and the "baptizee" demonstrate obedience when a Baptism takes place! Water Baptism is the “initiation rite” into the New Covenant. basically a covenant is a binding agreement. Circumcision represented a covenant between God and Abraham’s descendants in the Old Testament. Baptism represents a covenant between God and whoever comes to God through Jesus Christ. In Baptism you are saying that your sinful nature, has been "cut away" from you and that you now belong to Christ. Water Baptism shows that you have repented (turned away from your sins, and turned toward God), your sins have been washed away, and you have been made clean in God’s eyes. Water Baptism shows that when you became a Christian you were Baptized (immersed, submerged) into the body of Christ, or placed into Christ. You have clothed yourself with Christ. You are joined with Him. He is in you and all around you - That's a safe place to be! 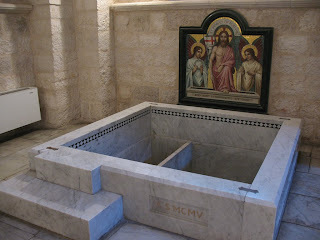 Water Baptism shows That your old life has been crucified, and buried with Christ. Out with the old! Water Baptism shows that you have been resurrected with Christ as a new person, with a new life. In with the new! How can Baptism be both a promise to God of a good conscience and a request to God for a good conscience?!? But it’s also a response to God from a good conscience - What?!? People think of “so help me God,” almost the same way they think of “I swear!” “Do you swear to tell the truth, the whole truth, and nothing but the truth, so help you God?” I asked my wife what she thinks of when she hears the phrase, “So help me God?” She said, “swearing in court.” So it’s an oath, or a promise. “I promise to tell the truth." "But God help me tell the truth." In the same way, this word here means that through baptism you are saying, I promise to keep a good conscience, but I can only do that if you help me, God. I promise to keep a good conscience, but I’m also asking for you to give me the ability to keep the promise of a good conscience! And the only reason I’m here being baptized is because you’ve already given me a good conscience!” It all works together. To sum it all up, being baptised in water represents being baptized in Christ. Being baptized in Christ is to be submerged, surrounded and saturated with the Lord Jesus Christ. So go ahead, take the plunge!